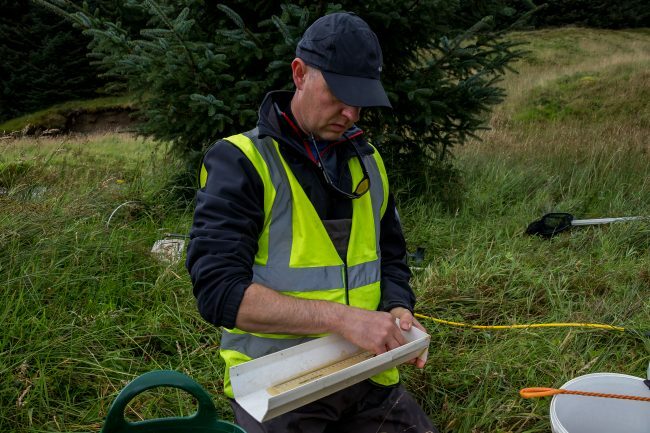 With Stuart giving a tour of various barriers and barrier easements across the Irvine catchment to a host of SEPA officials myself and Muir were in the Doon catchment completing electrofishing and invertebrate sampling on a number of tributaries. A very chunky trout from the upper Mossdale. I noticed worms reacting to the electric current, perhaps he has been gorging himself on these. 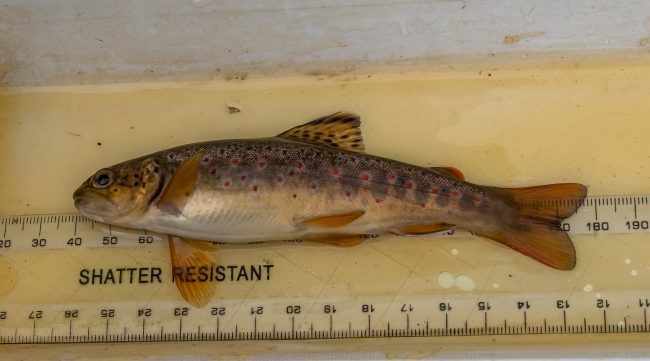 Whilst the recent rain and high waters in Ayrshire rivers are great for anglers, it can present a problem when it comes to completing our annual summer juvenile salmonid electrofishing surveys (amongst other things, high flows lower catch efficiency and make it unsafe to wade in the river with the equipment). As a result of low water and high temperatures at the beginning of the season we are behind our usual milestones in the field work season. 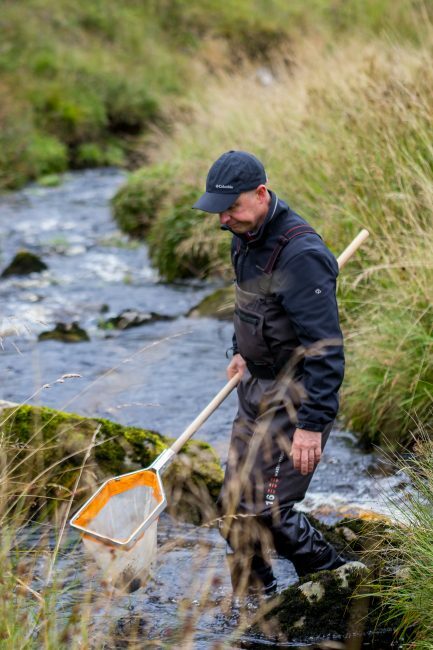 It was Muir’s turn to ruin his wading boots taking a kick sample, his grimace says it all! On most occasions we aren’t given to many surprises when it comes to species cropping up in places we don’t expect. And when we are given a surprise it tends to be of the invasive (introduced) variety. 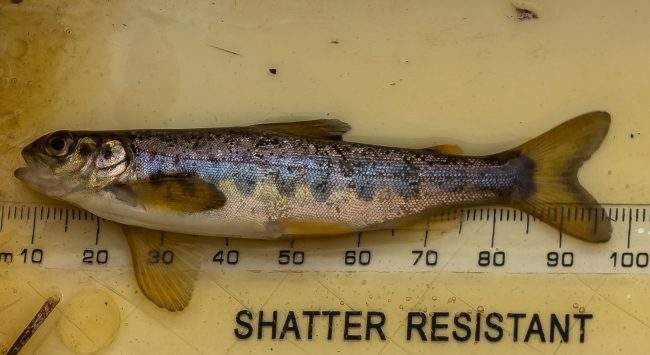 Today we found a salmon parr above a road culvert that was thought to be impassable (maybe not impossible but certainly very difficult). Unfortunately there isn’t a huge amount of habitat above the culvert which makes this a low priority for easement. 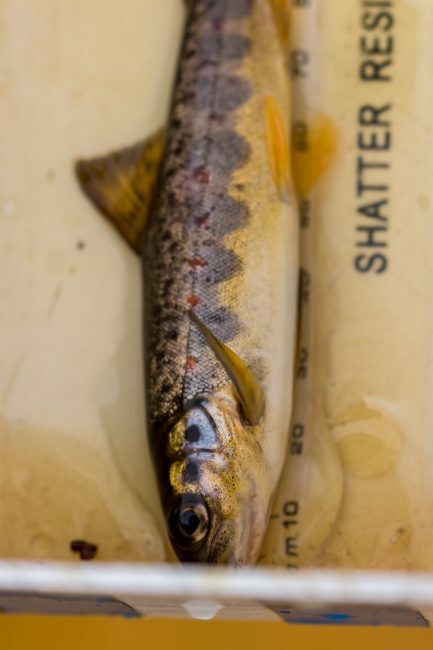 However it is very heartening to know salmon (very occasionally) make it through…..c’mon the fish!! We observed some damage on some fish and a very dark edge to the cadual (from the latin cauda meaning tail) fin. 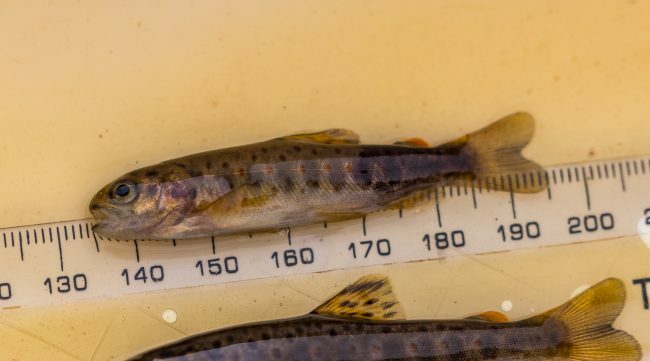 This brown trout fry had a very dark tail section but was otherwise quite healthy.